Vivekananda Kendra Kanyakumari: Universal Brotherhood Day was celebrated in three Nagars in Hyderabad Vibhag. Universal Brotherhood Day was celebrated in three Nagars in Hyderabad Vibhag. On 11 September 2018, at Kaushalam, Hyderabad - UB Day was celebrated with 120 well wishers and students. The Chief Guests were Dr. Veeresh, Research Guide from Pullareddy College and Smt. J RAMA DEVI Principal of Kendriya Vidyalaya, Langar Houz, Hyderabad. Ninety-six selected students from Swadhyay Competition based on "Swami Vivekananda's Life & Message" were awarded Medals and Certificates. Philanthropist Sri Raghava Reddy garu, Vibhag Sanghatak Sri Deepak Khaire, Prakalp Saghatak Sri G Srinivas, Prakalp Vyavastha Pramukh Sri P. Ramakrishna, Karyakartas, well wishers and participants of the ongoing Yoga Course were actively involved in the conducting of the program. Sri Hemanth Garu gave vote of thanks. On 15 September 2018, UB Day was celebrated at Dilsukhnagar. Over 300 students and well wishers graced the occasion, and 110 students were awarded medals and certificates for their performance in Swadhyay Competition. Vibhag Sanchalak Sri Ramaraju garu, Vibhag Pramukh Sri Sudhakar Reddy, Nagar Pramukh Dr. Komalamba and samiti members and karyakartas, well wishers were present. of RK Math and Padmasri N.Divaker, Former Director,DRDO were present as Chief Guests. 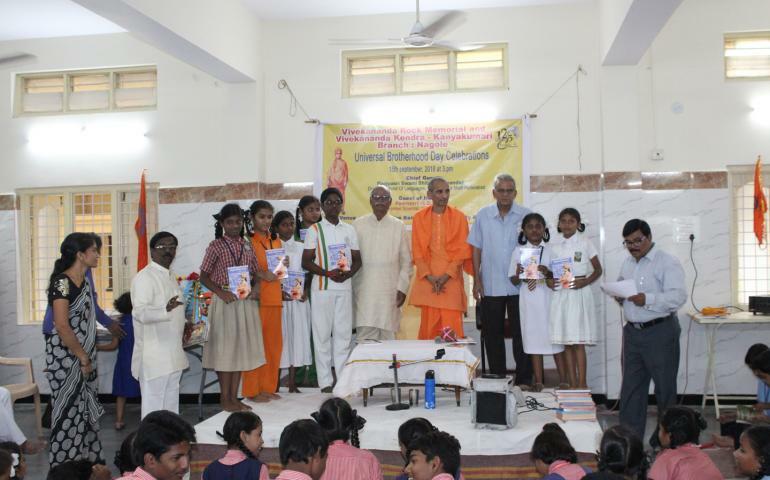 Swamiji addressed the 300 strong gathering and gave away prizes to the qualified students of Swadhyay Competition. Nagar Sanchalak Sri Heeralal ji, Nagar Pramukh Sri P Srinivasuluji, Nagar Samiti members and well wishers were present in good numbers.